Do you think a Professional Plumber installed this or a homeowner? The T&P Valve (Temperature and Pressure) is a safety device that allows the water heater to relieve pressure if necessary. The copper line is to divert the hot water and steam, this one is crimped closed – hum where does it go now? A T&P relief valve for water heaters or hot water storage tanks is an emergency safety device. When properly installed, the valve allows water to discharge when conditions arise that require such an action. These conditions can be either excessive pressure or dangerously high temperature, or both. In the event of excessive pressure, the T&P valve will open to relieve the pressure by discharging an amount of water to waste. In doing so the pressure of the water in the tank is reduced. In the event of excessive temperature, the T&P valve will open and discharge an amount of water. In doing so cold water enters the tank to replace the discharged hot water, thus bringing the overall temperature of the tank back down to a safe level. DRAIN LINE: Given the above functions of the T&P relief valve, a correctly installed drain line is essential. The drain line should terminate in a location that will not cause personal or property damage in the event the T&P valve discharges. The drain line should be installed in conjunction with a drain or trap that conveys any discharged water safely to waste. The most common problem with a water heater installation is an absent or incorrectly installed drain line. It is essential to install a drain line in accordance with the relevant codes. 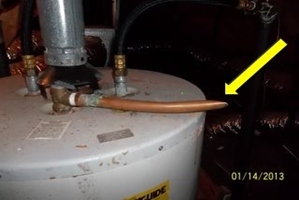 Dallas, Fort Worth Professional Home Inspector, Chris Goggans, found this water heater deficiency and now the buyer will be able to negotiate with the seller to have this line properly installed so she and her new home will be safer.